The 2011 Grand Prix of Japan was originally scheduled to take place in April, but due to the Great East Japan Earthquake on March 11, 2011, the race was promptly postponed. It was tentatively rescheduled to October 2nd, its traditional spot on the Moto GP calendar. In the last 3 years, the Grand Prix of Japan was scheduled to take place in March/April. The first year was run without a problem, but the following year it was moved to October due to the volcanic eruption in Iceland. The volcano prevented teams and some of the equipment from flying out to Japan due to safety concerns. This year, while rescheduled to take place from September 30 to October 2, the race had been in doubt for some time. Twin Ring Motegi Circuit is located just over 120km from the Fukushima Daiichi Nuclear Power Plant and with that distance it made the riders and a lot of their crew nervous about coming to Japan. There were only a few people who were advocates for Japan and the loudest was, naturally, Hiroshi Aoyama. It doesn’t hurt that he is Japanese and his feeling is that the Grand Prix would help Japan and the riders would be safe. 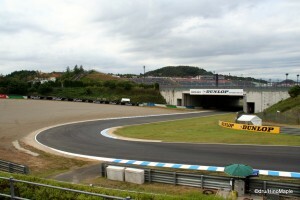 After Dorna, the rights holder for Moto GP, along with the FIM (Federation Internationale de Motorcyclisme) contracted an Italian University to conduct an independent survey of Motegi and the surrounding towns for radiation levels both at the track, in the soil, and the food, most of the teams started to feel safe. Unfortunately, while the scientific study said things were safe, the riders and many of the crew were still nervous about going to Japan and up until the last few weeks prior to the race itself, there were still big questions marks over who would or wouldn’t be attending. In the end all of the riders came to Japan but not all of the teams. Some of the teams, two as far as I know and both in lower classes, decided to not bring their mechanics and used local mechanics instead. The entire Moto GP tour also brought their own food and water to allay any fears they still had. It was an interesting compromise that provided a great event. If you read my past posts about the Moto GP events, things haven’t changed too much. This year there was no presence by Kawasaki. They still had a very small booth last year but that has all disappeared. Suzuki has also significantly reduced their presence at the event with just a tiny booth that showcased a couple items for sale. Honda was still the largest manufacturer on display with Yamaha and Ducati a close second and third. Since I have been to this event many times, I feel as if I’m an expert in what to do when visiting these events. I typically entered the event and just did a lot of shopping on qualifying day. I spent more time walking around the event than before as I wanted to check out the vantage points from various places. Saturday is a great day to check out the various grandstands as they are all open to the public. On Sunday, the reserved seating areas are closed off to those with valid tickets so watching the warm-up or parts of the race from other locations is not allowed. This year I decided to change my tradition. For the last several years, I joined the Yamaha Supporters group where I would get free swag for supporting Yamaha. My favourite racer, Valentino Rossi, had changed teams this year to ride for Ducati, so I felt I couldn’t support Yamaha completely. I am a huge Rossi fan so I decided to return to the grandstands that I visited on my first trip to the Japan Grand Prix, the 90 Degree Corner. The 90 Degree Corner is considered to be the most exciting place on the track to watch the race. It is named 90 Degree Corner because it is a 90 degree right turn that follows a downhill section. The turn is also slightly off camber making it very tricky to get around quickly and smoothly. Many riders have run off at that corner and many have crashed. The other main corner is corner 3 where many other accidents occur. The main straight may have the advantage of being where other supporters are as well as the podium, but for real enthusiasts, heading to other corners can be a lot more fun. I always enjoy trying new areas just to enjoy the racing. This year, as mentioned, the event was under a different air. People were their regular selves and attendance seemed to be average. The booths were a little different as more secondary sponsors were present and some of the traditional Japanese sponsors had pulled out. Things are slowly changing, including the food. I noticed that while the barbecued steaks on a stick were the same, and so was the beer, I never noticed the curry rice before. I also never noticed how difficult it was to get water at the event. Most of the places were selling sports drinks, coke, tea, and beer. It was difficult to find anyone selling water anywhere. In terms of interviews and such, it was pretty standard. Suzuki’s test rider was one of the most prominent figures doing interviews and many others were going around. The most important people had huge crowds. Trying to watch interviews with Jorge Lorenzo, Dani Pedrosa, or even Casey Stoner was next to impossible unless you were waiting for nearly an hour before the actual event. I was pretty content to just enjoy the interviews from far away and just listen to them. Most of the things they talked about were pretty standard. “It’s good to be here. The track is a very stop and go track. You need a lot of horsepower and a good setup. I hope to do well.” You really can’t get much more out of a rider who must be very careful with their words. 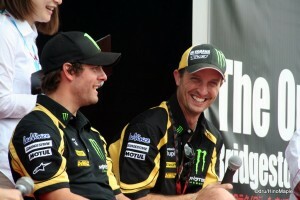 One of the best characters in Moto GP has to be Colin Edwards. I had been a fan of his since I first “met” him in a rider’s clinic in Vancouver prior to the 2005 season. I would discover that Colin has a remarkably frank way of speaking as well as being comical. He was pretty honest about his opinions without getting into too much trouble. He praises the bike all the time but hits out when he knows he has troubles. He is also very honest when it comes to his own mistakes and does what he can to improve. Next year will see him move from the Tech 3 Yamaha team to a new team that hopes to use his skills to develop their new bike. In terms of the race, everything was pretty standard. I was very happy and enjoyed the first two races. It was the last year of the 125cc class as next year they move to 250cc 4-stroke engines and calling the class Moto3. It was a nice race and somewhat predictable. Motegi isn’t well known for its exciting 125 races as the long straights mean the riders can stretch out a bit and get away if they are lucky. Unfortunately that was the case and nothing much happened. The only special event was the fact that Frenchman Johann Zarco finally won his first race in Moto GP. He had actually crossed the finish line in first near the beginning of the season but that was cancelled as he made a dangerous move on the last lap resulting in a 20 second penalty. A second time he crossed the line tied for first but lost the win because his fastest lap of the race was slower than the other rider. It was the first time that he was allowed on the top step to celebrate with champagne as the winner of a race. In Moto2, the race was more interesting. Marc Marquez has been showing his form and has made a charge up the championship field to take over the championship lead after this race. The race was won by Andrea Iannone who has a lot of talent but tends to make too many mistakes. The big event is Moto GP. It was time for the big boys to come out on to the track. 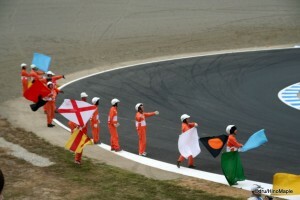 The Moto GP race was an incident filled race. It started with a crash by Valentino Rossi in the 3rd corner of the first lap. He ran into Jorge Lorenzo as he tried to avoid Ben Spies which causing him to crash into the sand. He retired before he could even finish one lap. Needless to say I was very disappointed. Casey Stoner was leading quite well until he had a tank slapper on the back straight which caused his brake pads to move which resulted in him losing his brakes for a second and subsequently running off course and into the sand. He did rejoin in 7th place before finishing the race in 3rd. 3 riders were given a ride through penalty for jumping the start and 2 other riders crashed before the end of the race. 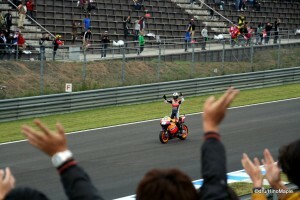 The field was reduced by a large margin and the winner would eventually be Dani Pedrosa. It had been a long time since Honda had won on home soil and Jorge Lorenzo did his best to steal the win at the end but couldn’t keep up with the dominant Dani Pedrosa. There were some spirited passes throughout the field the entire race and it was one of the more enjoyable races I saw. I usually get a little tired about halfway through the race in the main grandstands but this year was much better and easier at the 90 Degree Corner. I think I found my new home unless Valentino has his own supporter’s tour that will stay in another grandstand somewhere. Track crew celebrates after the race. I have said it many times before. 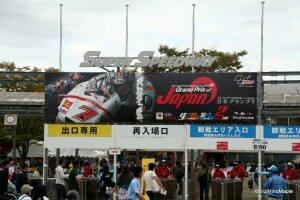 If you love motorcycles, you should watch the Grand Prix of Japan in person. It is a very fun experience. Racing in Japan is very similar, be it F1, WRC, or even Moto GP. I have watched all three now and while they are all different, the feeling is similar. The fans carry flags and wave them feverishly. People love their heroes all the time and do their best to will them on. Like any country, the races themselves are exciting to watch and the food can be expensive. With the right mindset, you will have the time of your life and memories that will last a lifetime. This entry was posted in Motorsports and tagged 2011 Grand Prix of Japan, Grand Prix, Grand Prix of Japan, japan, Japan GP, Japanese Grand Prix, Motegi, Motegi Town, Motegi Twin Ring, Moto GP, MotoGP, Motorcycle, tokyo, Twin Ring, Twin Ring Motegi, ツインリング, 日本, 東京, 茂木 by Dru. Bookmark the permalink.